The best dog treats start with premium ingredients. Chewy Louie® Small Peanut Butter Filled Bones are natural beef bones stuffed with a tasty peanut butter flavored filling to entice picky eaters. Filled bones are free from bad stuff, like common canine allergens and grains. They’re naturally rich in the good stuff, like protein to help power your active dog. Safety First: Natural bones may splinter or break causing injury. Supervise use and give in limited quantity if your pet is not used to this treat. If bone should splinter or break, remove immediately. Discard any pieces that could be swallowed by your pet, as pieces can cause choking, gastric upset, or blockage. Remove the bone if your pet is trying to break it since chewing a hard treat this way could damage a pet’s teeth. 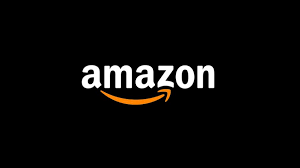 Recommended size is slightly larger than your pet’s mouth. Always provide a fresh supply of drinking water. How Long Do Chewy Louie® Filled Bones Last? The lifespan of our products really boils down to how aggressive of a chewer your dog is. Our filled bones typically last longer than standard dog bones due to the delicious filling. Stuffing our dog bones with tasty filling adds an extra challenge for pups — they'll have a blast trying to lick up every last bit of that yummy stuff! After the filling's gone, your pup will be left with a perfectly delicious dog bone to enjoy. What is the Recommended Size for a Dog Treat? The recommended treat size is slightly larger than your pet's mouth. A smaller sized treat could potentially pose a hazard to your pet. It is important to understand your dog’s chewing behavior. Caution is advised for pet parents with dogs that have a tendency to swallow chunks. We also recommend keeping an eye on your pooch as they indulge in this durable chew and to provide plenty of drinking water. 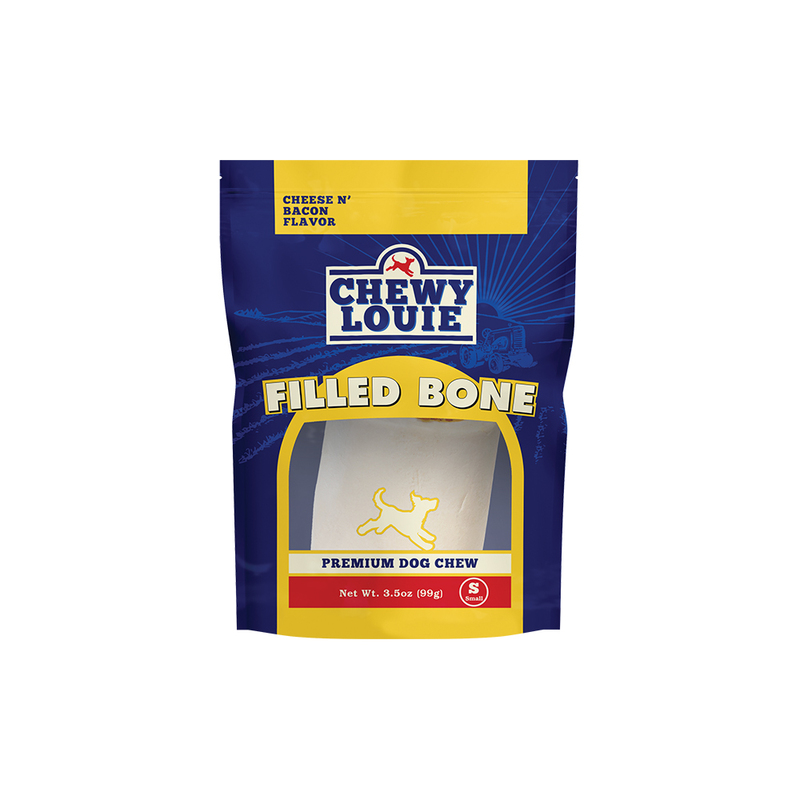 What is the Best Way to Give My Dog a Chewy Louie® Bone? They are great for teething, reducing stress, or boredom in a dog. Bones should not replace a meal and should be given as a treat or chew. Monitor your pet while giving natural chews and give in limited quantities, especially if your pet is unfamiliar with this treat. Do not allow your pet to swallow large pieces and discard pieces that could be swallowed by your pet. Always provide a fresh supply of drinking water. 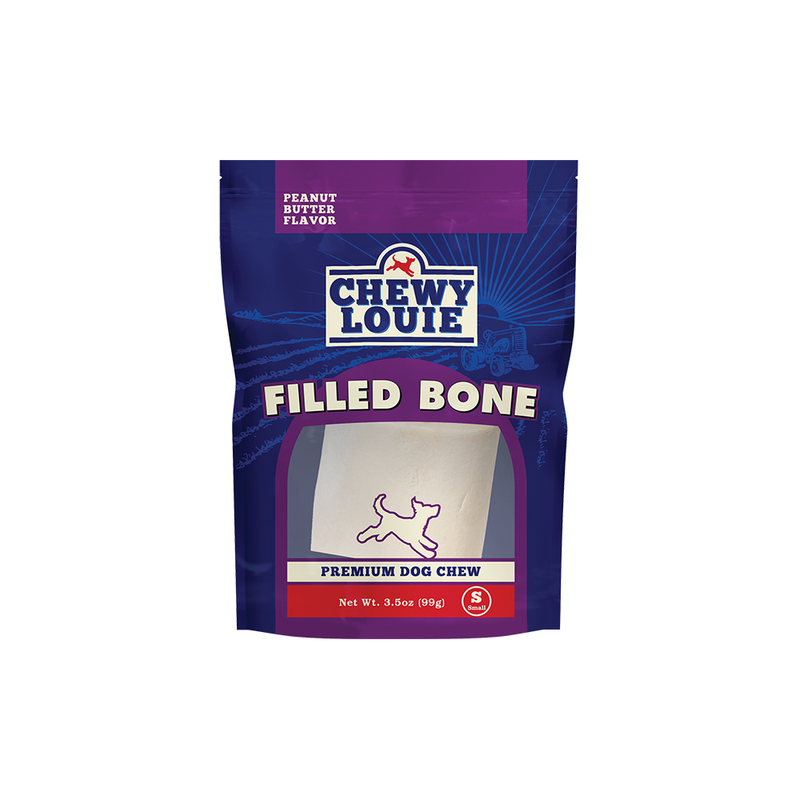 Are Chewy Louie® Filled Bones Healthy? Yes! Chewing bones is a great way for your pup to satisfy their natural instinct to chew and relieve stress and boredom. Plus, chewing on filled dog bones helps to naturally remove plaque and tartar buildup from her teeth and gums. As an added bonus, our bones are a great natural source of phosphorus and calcium to help your pooch build strong bones for years and years of playtime. Happy and healthy pups are simply the best! 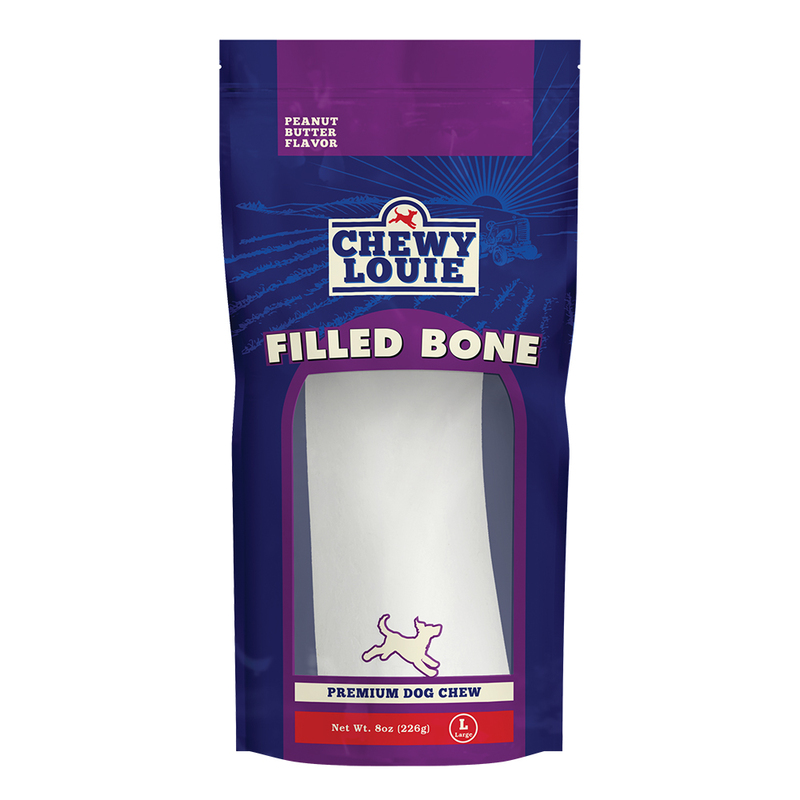 How does Chewy Louie® Source its Bones? Our commitment to providing the best quality ingredients, in every facet of the word, is always a top priority at Chewy Louie. We have high standards, so if we wouldn’t give it to our pets, we wouldn’t give it to you. The sourcing of items from the United States is important and contributes to high-quality pet products. However, we find that the importance of sourcing U.S. products can vary by ingredients. At times, ingredients from abroad can be found to be of higher quality than ingredients found in the United States. Some of our bones are sourced and manufactured in Ireland at a company that we hold to the same quality assurance standards as our Kansas-based facility. The United States food safety laws require international food and pet food factories to have the same safety and quality assurance standards as a United States based facilities would. What does Chewy Louie® Do to Make Sure Your Bones and Treats are Safe? We believe our customers deserve to feed their pets the safest products that have undergone extensive safety measures and standards of preparation, as well as, through processing and handling in order to ensure an all-around, high-quality pet product. Every day, we challenge ourselves to provide better and safer pet products. HACCP (Hazard Analysis and Critical Control Points) is a management system in which food safety is addressed through the analysis and control of biological, chemical, and physical hazards from raw material production, procurement, and handling, to manufacturing, distribution, and consumption of the finished product. Our HACCP program includes multiple required programs specifically designed for our facility and the pet treats and foods we produce. Product and raw material analysis, production and environmental monitoring, and facility audits support the HACCP program. Are Chewy Louie® Filled Bones Safe for Puppies? 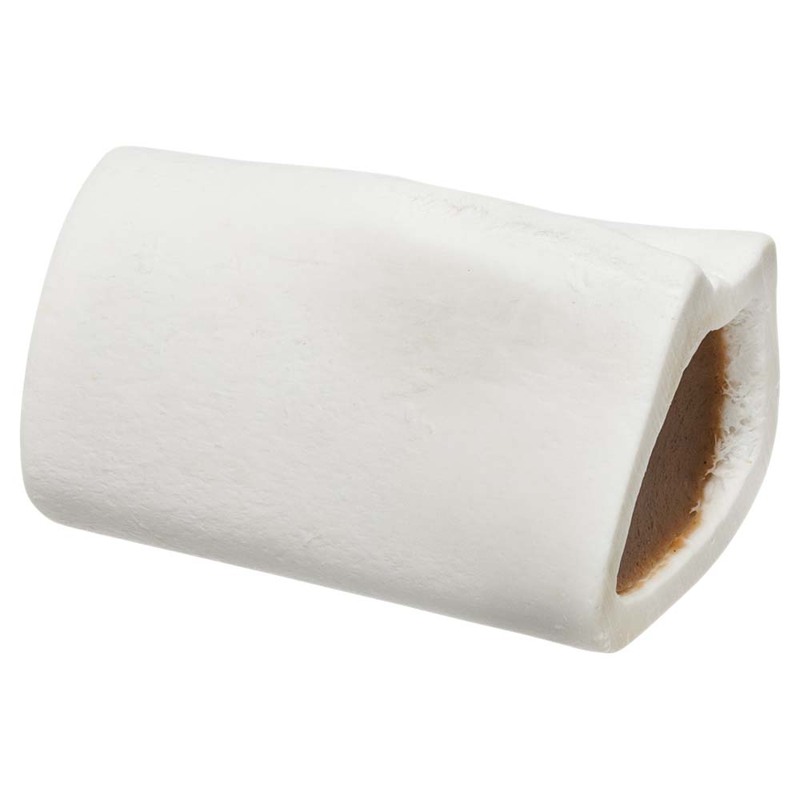 We carry smaller sized filled dog bones that are appropriate for puppies and small breeds. No matter your dog's size, it's important to always supervise your pup and offer plenty of fresh water during chew time to ensure the safest experience possible. The dental health benefits of dog chews and dog bones are great because of the natural mechanical action. 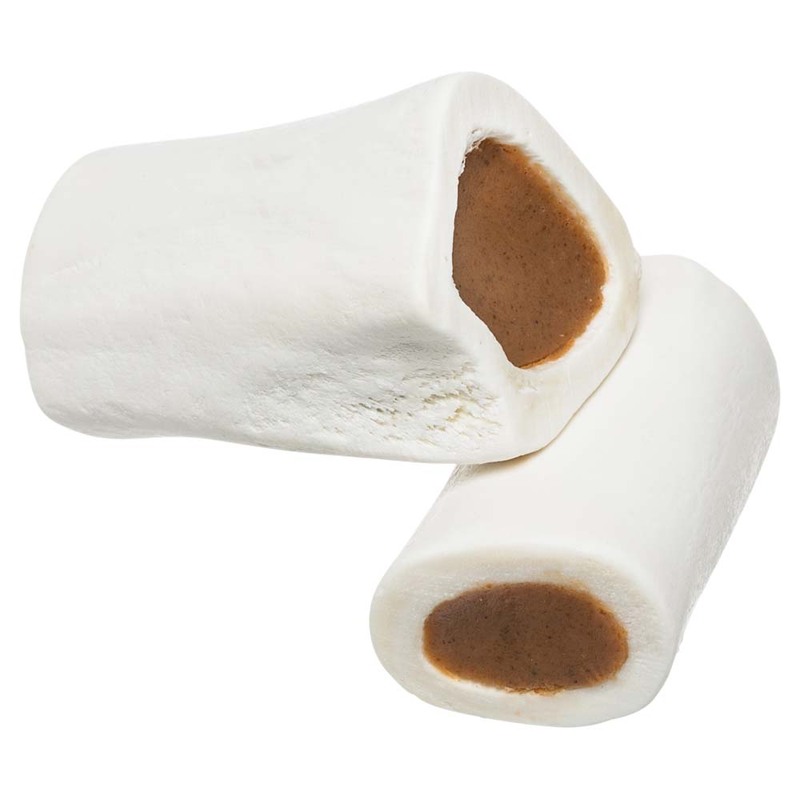 As dog’s chew, they help strengthen their teeth and naturally reduce plaque and tartar buildup. Although it won’t replace regular brushing or visits to the vet, dog chews and bones can be helpful in preventing serious dental problems. I Purchased a Chewy Louie® Small Filled Bone and My Dog is Actually Eating the Bone Part - Is This Harmful? While we slow roast our bones at low temperatures to ensure the integrity of the bone and to reduce the possibility of breaking or splintering, we strongly recommend careful supervision while your dog enjoys any kind of chew (bone, tendon, ear, etc). It is very important to choose a chew that is the appropriate size and type for your dog's chewing style. If your dog is chewing off pieces of bone, we recommend that you take the bone away from him. While some chews are digestible in small pieces, bones and large pieces of chews may not pass through your pet and may require veterinary care. If you are not sure which chew is appropriate for your dog, please consult with your vet for suggestions based on your dog's chew personality.